After the first enumeration required by the first article of the Constitution, there shall be one Representative for every thirty thousand, until the number shall amount to one hundred, after which the proportion shall be so regulated by Congress, that there shall be not less than one hundred Representatives, nor less than one Representative for every forty thousand persons, until the number of Representatives shall amount to two hundred; after which the proportion shall be so regulated by Congress, that there shall not be less than two hundred Representatives, nor less than one Representative for every fifty thousand persons. 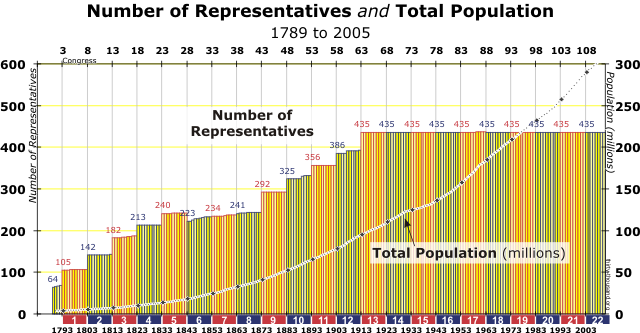 Back in 1911, Congress froze its size at 435 members of the House of Representatives, and so the amount of people representative by each representative has grown extraordinarily. (Note that this is before we even had all the states (only 46), so the Reps continued to spread thinner.) The average district size now is about 700,000 people, which is a lot of people and opinions to accurately represent. Of course, if we followed Article the First to the letter, we would now have about 6300 representatives, which seems like a lot. But what if the article is a formula, not meant to stop at districts of 50000? The way it is written, it seems like every 100 Representatives would prompt an increase in the size cap of districts by 10000. So how could we model that to determine how many reps we need? Well, in general, the population divided by the number of people in the average district should give us the number of reps. So if P = U.S. Population, R = number of representatives, and D = max size of district, then . , and solving for D gets us approximately 186000 people per district. Plug in for D to get 1660 representatives. (Exact amount varies by the precise district make-up.) That seems quite possible, not even four times as many as we have now. Is 700000 people too many to represent? Is 190000? What would be an ideal amount? How would representing 30000 people in 1790 be different from representing that many people now? How does technology change how effectively we can represent people? How could we accommodate having 1700 representatives? What changes would need to be made? What other representative systems could you come up with? How would it work? How would having more representatives change our current representation? How are representatives apportioned in other countries? What methods do they use for determining the size? 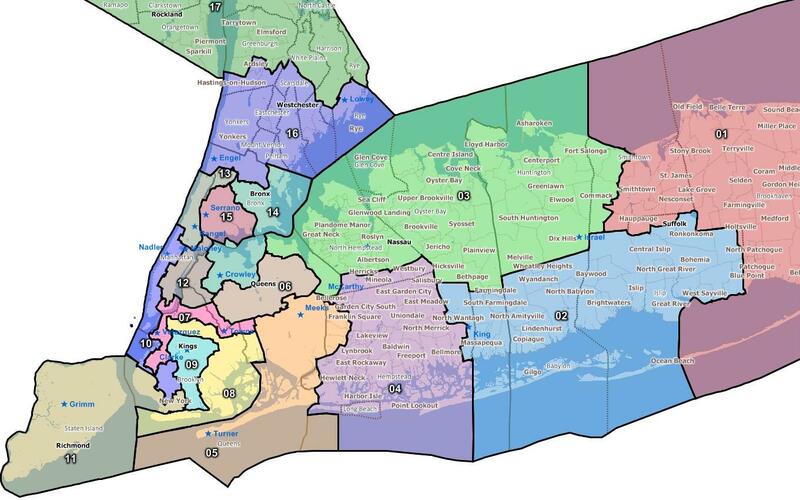 For that last one, I think it’s interesting to just look at the Congressional districts of New York City as an example. I live in District 12. It’s easy to see that the district is half in Manhattan, in the affluent Upper East Side, and half in Queens, in Astoria/Sunnyside/Long Island City. I think it would be very easy to believe that the desires of the people on the UES don’t always line up with the desires of the Queens constituents. Yet we are represented by just one person. However, with a smaller district, they can be divvied up more logically. All of Astoria has 166,000 people, which is almost a full district, and it would be nice to have a district that is clearly where you live. Since US History doesn’t usually line up with Algebra, this idea might be hard to implement in math. Though it could work fine in Algebra 2. And it might work even better as a history lesson with a bit of math, instead of a math lesson with a bit of history? I dunno. But I think it can definitely be food for thought for any class.